If you are using the latest Microsoft Office 2013 version, then you might have noticed that it doesn’t features Microsoft Office Picture Manager application. Picture manager is an excellent and a small application integrated in the Office Suite which allows the users for viewing, managing and editing the pictures easily and quickly. It features some advanced image editing tools like auto correct, crop, rotate, flip, resize, red-eye removal and more. But unfortunately Picture Manager is missing from the Microsoft Office 2013 version and many users are missing this program and they want to get it back. Here is the simple tutorial which helps you to install the missing Picture manager tool in your PC containing the latest Office 2013 version. You can use the Microsoft Office version setup such as Office 2010, 2007 or 2003. Now run the Office installer, enter the product key and when it asks for installation, click on Customize button. 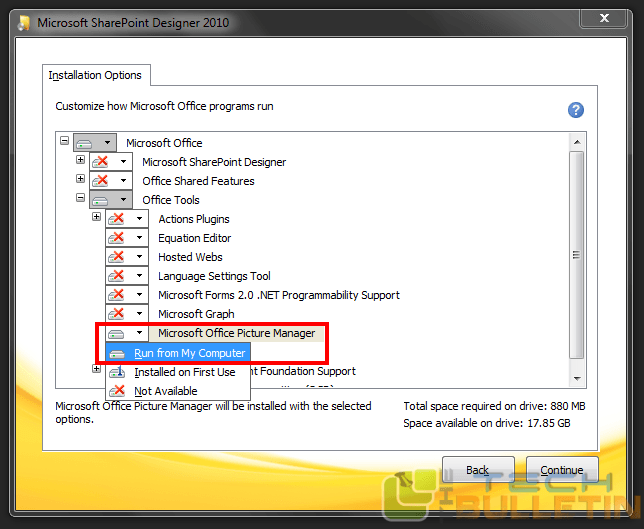 If you are not having previous Office version, use the Microsoft SharePoint Designer 2010 to install the Picture Manager. Now on the next screen, click on the each given program and select Not Available from the options. Then click on Microsoft Office Picture Manager link in the Office Tools section and select Run from my computer option. Now you will get the option, where all the program entries except Picture Manager will have the red cross icon on them. That’s it, you are done, now click on Install Now button and allow the setup to install the program. It will take few minutes and once the setup completes, you can enjoy the Picture Manger program in the Office 2013 version.